September is always a lean month. Many musical organizations do not start their seasons until October. There are, however, a number of early events. The Toronto Symphony Orchestra begins its season with a concert at Roy Thomson Hall featuring Renée Fleming on September 21, her first visit since an October 2015 RTH recital, accompanied by Gerald Martin Moore. The program features Ravel’s Shéhérazade as well as works by Puccini and Leoncavallo and selections from The King and I by Rodgers and Hammerstein. Mahler’s Third Symphony, which the TSO will perform September 28 and 29, was not a favourite of Otto Klemperer, an early admirer and interpreter of Mahler’s music. In fact, he refused to conduct it. Times have changed and I think that there is now fairly general agreement that the Third is one of Mahler’s finest works. Peter Oundjian conducts and the mezzo solo will be sung by Jamie Barton, the young American singer who gave such an impressive recital for Toronto Summer Music last July. 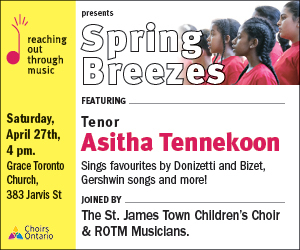 The choral parts will be taken by the women of the Amadeus Choir and the Elmer Iseler Singers and by the Toronto Children’s Chorus. The Women’s Musical Club of Toronto's directors have over the years demonstrated a superb sense for finding the finest artists. It looks as if they have again found an exciting performer for their opening concert on October 6. The tenor Issachah Savage will be familiar to some Toronto audiences as he was the cover for the role of Siegmund in Wagner’s Die Walküre at the Canadian Opera Company last spring and performed the role on February 7. He also won the 2014 Seattle International Wagner Competition and has sung at the Metropolitan Opera in New York. His Toronto recital at Walter Hall on October 6 will include Schumann’s Dichterliebe, Beethoven’s An die ferne Geliebte, songs by Strauss and Quilter as well as a selection of spirituals. The Toronto Masque Theatre’s 2016/17 season will start off with a salon concert on September 19 at The Atrium, 21 Shaftesbury Avenue. The program consists of poetry and songs inspired by trees. The singers are members of the Elizabeth McDonald Voice Studio. TMT’s first regular concert will be on November 17 and consists of a particularly interesting coupling: Handel’s cantata Apollo and Daphne for soprano and baritone and Richard Strauss’ Enoch Arden, a monodrama for speaker and piano. More on this intriguing pairing as the season unfolds. And looking back: When it comes to finding the very best performers available, the track record of Toronto Summer Music is unsurpassed. But the festival has always done more than find performers. Their program has always included an academy in which young professional and pre-professional performers are mentored by senior musicians. In 2016 a new branch of the academy, the TSM Community Academy, was inaugurated. It was a program aimed at amateurs. I seriously thought of applying to the program but in the end was too intimidated to do so. I did go last summer, however, and realized that, while the program was extremely demanding, there was no need to feel intimidated. The Community Academy consisted of three parts: instrumentalists were coached by professionals, mainly front desk players of the Toronto Symphony Orchestra or the Canadian Opera Company; pianists studied with David Jalbert; singers with Matthias Maute and Peter McGillivray. The work we singers focused on was Bach’s B Minor Mass. This was not the first time that I have attempted to sing the work but on other occasions we only had a day or an afternoon. These occasions always left me with the feeling that someday, in another life, I would get things right. I would not wish to claim that our performance last summer was everything it should be but we certainly got a lot closer than had been possible on earlier occasions. While we rehearsed all the choral parts, we performed only five movements. I think the decision to restrict us was entirely sensible. We were much helped by having four professional section leads. Separate from the rehearsals for the mass were the vocal lessons and the vocal masterclass conducted by Peter McGillivray. Kathryn Tremills was the very able pianist throughout. 2016 marked the final year of Douglas McNabney’s leadership of TSM. He will be missed. I am, however, looking forward with confidence to the new leadership which will be provided by his successor, Jonathan Crow. Aug 26 to Sept 3: Soulpepper presents “Taking the A Train Uptown Manhattan – Harlem”: the music, words and ideas that have made Harlem great. Sept 9: “The Four Lads and the Four Aces: the Greatest Love Songs of the 20th Century” at the Palais Royale. Sept 9 and 21: A tribute to the folk songs of the 60s with Sue and Dwight Peters and Michelle Rumball at the Free Times Café. Sept 13: Nine Sparrows presents a free lunchtime recital by Linda Condy, mezzo, and Ellen Meyer, piano, at Westminster Park Baptist Church. Donations welcome. Sept 16: Kristine Dandavino, mezzo, and Michael Robert-Broder, baritone, will give a joint recital of music by Wagner, Schumann, Brahms, Weill and Sharman at the Women’s Art Association of Toronto. Sept 22: A free lunchtime recital at the University of Toronto Faculty of Music will feature the soprano Eizabeth McDonald in works by Beethoven, Spohr and Schumann, at Walter Hall. Sept 25: Vania Chan is the soprano soloist in Bach’s Coffee Cantata in the Rezonance Ensemble’s concert at 2pm at CSI Annex that also includes Bach’s Brandenburg Concerto No.5. Sept 27: The first of this season’s free vocal recitals at the Richard Bradshaw Amphitheatre features artists of the 2016/17 COC Ensemble Studio. Sept 12: A celebration of the Beatles hosted by Lucy Peacock is a fundraiser for PAL Stratford, an organization that offers support and affordable housing to retired artists in need; Avon Theatre, Stratford. Sept 16: The soprano Meredith Hall will sing Hasse and Handel with the Ensemble Caprice at the SweetWater Music Festival, Leith Church. Sept 17: Hall will also sing at another SweetWater Music Festival concert which includes Schubert’s The Shepherd on the Rock (with the clarinetist James Campbell), as well as a new work for soprano and community singers by David Braid.